If there was a single step you could take to make your stitches look more even, your mistakes less noticeable, your wearables fit better, your fabric drape better, your edges look smoother, and your finished projects look overall more professional, would you do it? What if I told you it’s really very easy and only requires minimal supplies, most of which you probably already own? Of course you would, you say? A lot of crocheters don’t do it. What on earth is this step I’m referring to? It’s blocking! A Clean Spray Bottle – put some water in it. Towel – little towels for little projects, big towels for big projects. Old ones that have been washed and dried multiple times to remove lint and excess dye work best. A Blocking Surface which is a flat, firm surface that can stand up to having pins stuck into it. Some people use a cork board, a bedspread, or a carpeted floor. Always protect porous surfaces from moisture with a layer of plastic. Specialized blocking boards are available for purchase, but I like to use linking foam squares that covered the floor of my kids’ playroom a few moves ago. I can create almost any size surface I need in whatever shape suits me best, and they’re waterproof! After you finish a project, a good wet blocking will even your stitches, refresh fibers that might have been toted around in the car or in a bag, and best help you pin and shape your item. 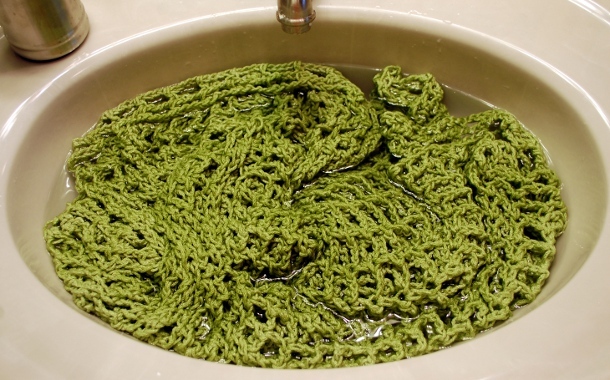 To begin, soak your item in a clean sink of lukewarm or cool water for about 15 minutes. Drain it carefully. Fibers are generally at their weakest when they are wet, so always be sure to support the entire weight of your project at all times. Gently – without wringing or twisting – squeeze most of the water out. 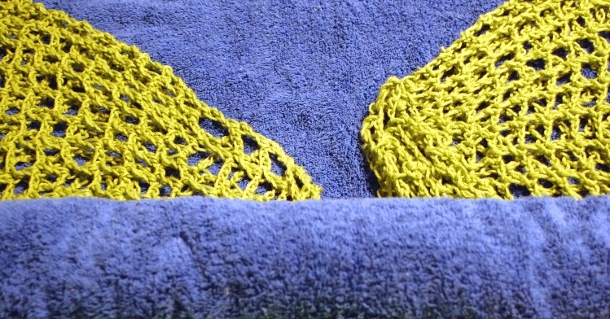 Lay out a clean towel and lay your project on it. Roll the item up in the towel and lean or even kneel on it to press out as much water as you can. At this point your project should be just damp. (If any part of your project dries out while you’re pinning, spray it with water and continue.) Lay it out on your blocking surface and pull it carefully into the desired shape. Begin adding pins. Start by putting pins at corners or other major points, then add more halfway between again and again until edges are smooth. Don’t leave points pulled out unless your edge is supposed to have points! They’ll dry in place and be visible on your finished object. Once you’re finished, walk away and let it dry. (I like to do my blocking on the bed because I have a ceiling fan that I can leave on to help the air circulate so it dries faster.) Depending on the fiber and the fabric, this can take anywhere from 1-3 days. The difference between unblocked and blocked material is clearly visible. For reshaping a piece that’s losing its shape or something that only needs gentle adjusting, a spray blocking should do the job. (It’s also generally faster than a wet blocking, so it’s good if you’re in a hurry!) 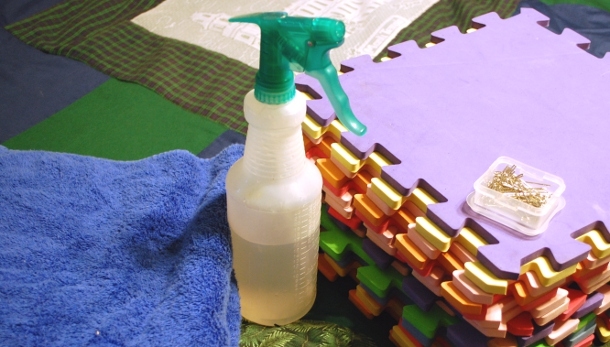 To spray block, lay your piece on your blocking surface and spray the fabric gently with water. Then pin as for Heavy Duty Blocking and allow to dry. Note: Blocking is ideal for emphasizing shaped elements in a crocheted piece. If your piece has points, shells, scallops, etc. they can easily look indistinct when freshly made. With a good blocking, your shapes can stand out sharply and cleanly. I hope you’ve been encouraged to give blocking a try. A small investment of time and effort with transform your hard work into something truly extraordinary with a clean and professional look! 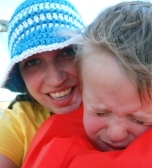 Melissa Mall is an at-home mom with four sons seven and under. They have just completed yet another transcontinental move – hopefully it will be their last!!! You can keep up with their ordinary adventures over at her blog, or take a peek at her crochet patterns and tutorials at Inner Child Crochet. Article & images © Melissa Mall. All rights reserved. I’ve been afraid of blocking for a while now, but I’m definitely going to try after reading this. THANKS!!! How awesome! I’ve got a piece of a blouse that I’m blocking on those foam puzzle pieces, too! Great minds think alike. 😉 They’re *way* better than using a piece of darn cardboard (which is what I used in the past) and great if you don’t have the bed space… Thanks to lazy pets! Lol. I really like your blocking tutorial! I love the photos you added — it really makes a big difference being able to see the pictures for something like this, so thanks so much for sharing all of this! I’ve read many blocking tutorials in the past, but it’s awesome to get to see your blocking in action! Plus, I’ve never seen a tutorial that included photos for blocking an actual top. I’ve only seen photo tutorials on blocking granny squares and such. Since I tend to crochet more tops than anything, I thought it was nice to see. I was wondering why you don’t have a pinterest link? It would help me to be able to keep my stuff organized. I love your blocking tutorial & the coloring book bag.